When I was asked to share my spiritual journey for my faith community last spring at a “coffee and conversation” between services, I wondered about how I could convey a bit of how much I had been changed and shaped by the people I have come to know as friends and colleagues on my journey of faith. My faith journey has meandered, and many years have been spent on more of a solitary journey. Solitude and stillness continue to be important parts of my spiritual life, but being immersed in a community that I have learned to trust has been equally powerful in its impact. So, I decided to mirror these experiences. I had some solo time at a conference, and I used it to create some watercolors that reflected my experience of the divine. The three images I ended up with were music; social justice; and myth and mystery. The “myth and mystery” piece on its own was a somewhat abstract piece with the Celtic triquetra knot in the forefront. That image conveys so much to me: it is the trinity, it is the three faces of the feminine divine, it is the mind, body, spirit connection and it is the past, present, future intertwined into eternity. This image I carry with me always…it is literally tattooed on me. I brought all three of these pictures, as well as a set of multicolored markers, to my talk. I told my journey that day (you can read it here on my blog, too) and I passed around my paintings and supplies and told my friends to add to and embellish them as they saw fit. At first, people were nervous about that, but after some insistence, they began to add to it with words and doodles and phrases. I felt, as I sometimes do, the presence of spirit in that place as we expressed and experienced the divine in our midst. The finished picture of “Myth and Mystery” is probably one of the most meaningful images I have ever seen. It speaks to me far, far more than the original image I created. I catch a glimpse of something different every time I look at it. And, I look at it often. I keep it very close to me, hanging in my office behind my desk. I center myself by looking at this co-creation of faith through art, and I realize how much more I have come to know about the experience of the divine by letting go of my own solo impressions and allowing others to make their additions, to modify and embellish from my original expressions. It becomes a rich, life-giving experience of continual insight and understanding, rather than a static set of beliefs or a self-selected view. To me, this is the true peace that comes from being in community, living out my faith by allowing others to co-create meaning with me. We embellish and give life to the works of art that are our respective journeys of faith. 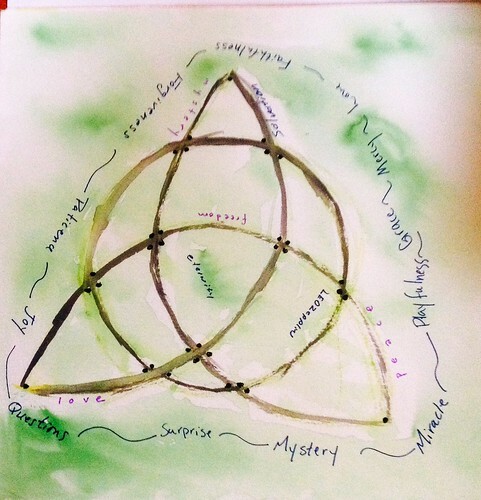 This entry was posted in advent 2013 and tagged Advent, Art, community, faith, Spiritual journey, tattoo, triquetra. Bookmark the permalink.